The non-violent peace activists ‘DISARM the drones 6’ included VCNV Co-coordinator Susan Clarkson managed to breach security at Britain’s drone control base in Lincolnshire. Their threat was considered so serious the base went into lock down and they were kept over-night incommunicado, they were sent straight to court the next morning , but not before their homes were also raided by police and computers seized. Their action was timed to coincide with the fifth anniversary of the first UK Drone strike and the International Day of Innocent Children Victims of Aggression. 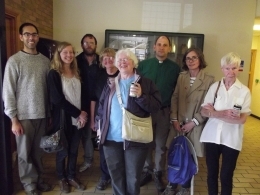 The six individuals, who took in news stories about civilians killed as a result of drone strikes were: Chris Cole (Drones Researcher), Martin Newell (Catholic Priest), Dr Keith Hebden (Anglican Priest), Susan Clarkson (Quaker Pensioner), Henrietta Cullinan (Teacher) and Penny Walker (Grandmother). They all felt moved to act after British Armed Drones (Unmanned Combat Aerial Vehicles) became operational from British soil on the 25th April 2013, and the MoD has since confirmed that British drones controlled from RAF Waddington have made their first kill in Afghanistan. Serious legal questions have been raised by the UN, Britain and the US about the legality and morality of drones, especially around their use in undeclared wars. As part of their legal defense 'DISARM the Drones 6' plan to invoke international law which reserves the right to break a law in order to stop a greater harm from happening. The 6 have been bailed until a preliminary hearing on the 4th July 10am at Lincoln Magistrates Court. 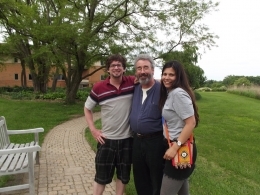 MAYA EVANS (VCNV co-cordinator) will be starting an anti drone peace walk today across the state of Iowa: She will be walking with Brian Terrell- recently released from a 6 month prison stretch for protesting against drones, and Kathy Kelly. The walk is coupled up with a mini speaking tour across Iowa state where drone are manufactured and controlled from. DAVENPORT -- U.S. and British drone attacks in Afghanistan and Pakistan are killing civilians, breeding more terrorism than they prevent, and making us less safe, peace activists said Sunday in a presentation at Magnifcat Chapel. Sponsored by the Sisters of Humility, the discussion was organized by the Chicago-based Voices for Creative Nonviolence (vcnv.org) to kick off a195-mile anti-drone demonstration and walk starting this morning. It is aimed at educating the public on predator drone operations in Iowa and western Illinois. Marchers from across the U.S. will walk from near the Rock Island Arsenal, where they say drone engine components and bomb parts are made and stored, to the Iowa Air National Guard facility at Des Moines Airport, the planned site of a new command center from which unmanned drones flying in other countries will be remote piloted. "Crimes against humanity are being committed with this drone program," said Brian Terrell, of Maloy, Iowa, who recently completed a six-month federal prison term for protesting the drone command center at Whiteman Air Force Base in Missouri. The former head of the Catholic Peace Ministry in Des Moines (and a former Quad-Cities resident), Mr. Terrell has been arrested about 200 times in 35 years, mostly for trespassing and other acts of civil disobedience. "The war is coming home," he said. "They're going to be committing these crimes from a civilian airport in Des Moines, Iowa, making the civilian airport in Des Moines a legitimate military target." "It's inviting attacks. People are calling for vengeance," Mr. Terrell said of the furor surrounding 4,700 victims of 300-plus U.S. drone attacks in at least four countries, including many civilians, noncombatants and even U.S. citizens. "This is a very dangerous game we're playing. We should not believe that this is keeping us safe. We are really being put at peril every day. It cannot not come back at us." In a May 23 speech at National Defense University, President Obama said drone strikes are a necessary evil, but one that must be used more selectively as the U.S. security situation evolves. "There is a narrative that he wanted us all to swallow -- that this is fine technology, pinpoint precision; it picks out the bad guys. Our soldiers are not in harm's way. They can sleep in their own beds at night," Mr. Terrell said. "The narrative is absolutely false. It's a total lie. That narrative is falling apart." He also claimed the president is being hypocritical, after supporting Israel attacking Gaza. President Obama justified that choice because "he said no country can tolerate attacks from missiles by a foreign entity," Mr. Terrell said. "This is not keeping us safe."